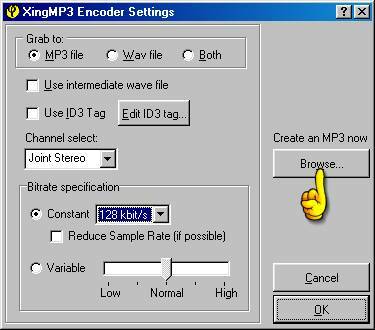 Several methods exist for copying music from your Minidisc recorder to MP3 files. You have two main choices, which will be dictated by your sound card and the facilities offered by your MD. If you have a new style sound card with digital input, and have an MD which has digital ouput capabilities, it is possible to copy from your MD recorder digitally which will usually give you the best reproduction possible. If you don't have these facilities, you will need to an analogue copy. This is not necessarily much worse than digital, although the quality or the recording will be dictated by the quality of the ADC (Analogue to Digital Converter) in your sound card. The only differences between using a portable and a HiFi MD unit, are the cables you will use. The first thing you will need to do , is identify the Line In socket on your sound card. This may not be labelled on the card itself, so you may find you need to reach for the manual to find out which of the sockets it is. You may find the socket is labelled Aux In instead. This is the same as a Line In socket and so can be used. You can not use the Mic in socket, as ths will result in damage to your sound card, and possibly also to the Minidisc player. Once you have located the Line In socket, you will need to plug one end of the cable into the socket. The cable you use will depend on the unit you have. Portable MDs usually come with a cable which has a 3.5mm jack at one end, and 2xRCA connections at the other. You cannot use this cable to connect to your sound card. 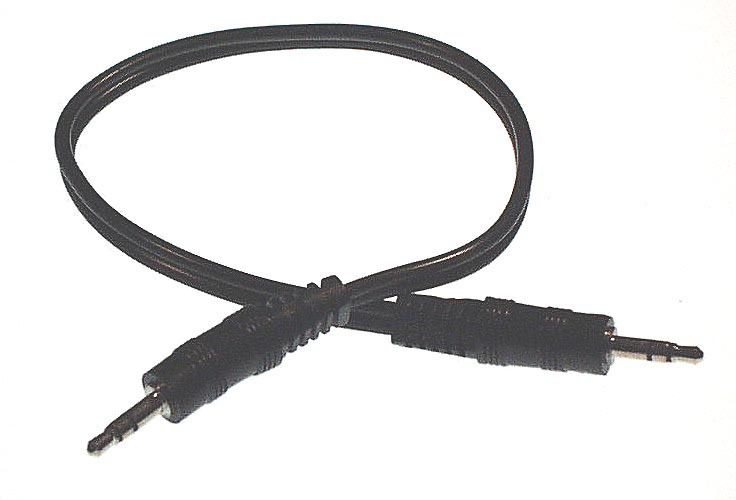 Portable users need a cable with a 3.5mm stereo jack socket at both ends of the cable, as shown in the picture above (left). HiFi MD users should obtain a cable as shown in the picture above on the right. Locate the Line Out socket on your MD, and insert the other end of the cable into this socket. If you have a HiFi MD unit, you should connect to the output connections on the rear of the unit, labelled either "Play", "Line Out" or "To Amp" depending on the make of your MD. You may now jump to the recording section. Please note thjat most portable units do not have digital outputs, so this section will only apply to users of HiFi MD units, or bery modern portables. There are two versions of digital connectors on sound cards; Optical and Coax. Although the method of copying is the same, the way in which you connect the equipment isn't. Please choose either Optical or Coax depending on the connections on your sound card. Using the optical connection the on sound card. If you are lucky enough to have an optical connection on your sound card, you can plug your optical TosLink cable directly into it, and you are ready to record. You may now jump to the recording section. Using the coax connection the on sound card. 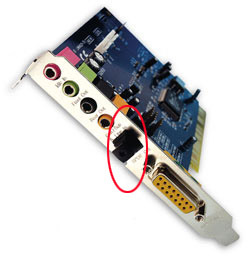 If you have a socket on your sound card similar to the one in the picture above, then you may need something to convert the signal into an optical format that you can connect your TosLink cable too. Users of some HiFi units can connect directly to this connection using a coax cable, but most users are not so lucky. Several solutions exist to overcome this problem. The easiest to use is a box that sits between your MD and the soundcard. 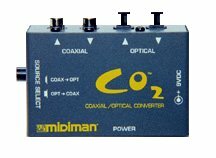 One such unit is the Midiman CO2 (picture below). Using this unit, you connect a coax cable from the soundcard to the CO2, then connect your Toslink cable from the CO2 to the MD. There are currently no DIY options that will convert optical into coax, only units that operate the other way around. You now need to tell your computer to accept input from the Line In socket. To do this, load the mixer application by double clicking on the speaker at the bottom right of your desktop. From the "Options" menu, choose "Properties". You now need to select the option to adjust settings for Recording, as shown in this picture. Now ensure there is a tick next to the word Select for the Line In, as shown in the picture. You will also need to make sure you have the input volume slider somewhere between half way and full volume. The position of the slider will depend on the volume of the disc you are recording and the amplification on your sound card. You can also ensure that you get as little background noise as possible by clearing ticks from other inputs such as CD Audio and Microphone. Ensuring the Microphone input is not selected is the most important, as this can generate a very large amount of hiss which is very noticable in the end recording. You should now find that any recording software you run will be able to record the music you play on your Minidisc. The software you use will probably vary considerably, and will probably be using software that varies from the software I usually use. In the examples below, I have used Sound Forge 4.5 which is very good for manipulating sound. The main requirements for recording sound and ensuring a good quality recording, are that you should be able to see the level at which the recording will be made. Sound Recorder does not offer this facility, and is therefor almost useless for quality recording. WaveStudio, which comes with Sound Blaster cards, is adequate for the job as it provides a basic means of monitoring the sound volume before you start recording. The reason as to why this is important will become clear in a moment. By finding a loud passage in the music you wish to record, you can set the record levels so that the music will be loud enough to be free of background noise, yet not too loud so that it ends up distorting. Ideally, the peak of the music should hit somwehere between -6 and -3 on the scale (shown in the picture) so that any slightly louder passages will not cause distortion or clipping (a cracking sound heard on playback). If the levels are too high, use the mixer program to reduve the volume of the Line In input. If the volume is to quiet, then slide the Line In volume up a bit more. You can now stop playback and line the Minidisc up with the point at which you wish to start recording. The best way to do this, is to put the unit in Pause mode at the start of the track. When it is ready, click "Record" in your sound recording sofware, and press start on your Minidisc. You can now sit back and wait for the end of the music. When you reach the end of the music, click "Stop" in your sound recording software, and stop the Minidisc. You should now save your recorded file somewhere where it can easily be found. I suggest saving it in the "My Documents" folder. You should really now listen to the file you have recorded to make sure it has been recorded correctly. If you hear cracking sounds in the playback, or it is distorted, you probably had the record levels too high, in which case you need to turn them down a bit and record the file again. Don't forget to delete the old file first, otherwise you may find you run out of space on the hard disc. Typically, a recording will take about 10Mb per minute, so a 5 minute song will need 50Mb free on your hard disc. Once you have recorded your music and you are happy with the result, you are ready to turn the WAV file you have recorded into an MP3. There is a wide range of software for turning WAV into MP3, and the software you choose can have a big impact on the sound. Although the program I have chosen to use is really designed to grab music from a CD to make MP3s with, it has one of the best MP3 encoders available, and also has the ability to encode WAV files as MP3, whic is what we are about to do. You can get a shareware version of this program from many sites on the internet, or direct from the Xing Technology Web Site. In the program, you should click the Settings button, as shown in the picture. At the top of the window that opens you will see the option to alter where encoded files are saved to. On my system I have a drive (G:) that is just used for MP3 files. Most people will want to set this to somewhere such as "My Documents". The most important thing is to set it to somewhere obvious so that you will be able to find the MP3s easily. Once you have chosen your location, click OK at the bottom of the window. In the program, you should click the MP3 button, as shown in the picture. When you click the MP3 button, the following window will appear. Check that the options in your window match those in this one. Note that the blue box towards the bottom of the window has 128kbit/s selected. This value may be changed depending on what you want to do with the file. For listening on the computer at home, or via a laptop, I recommend at least 192kbit/s. I usually use 256kbit/s for my MP3 files. Using such high rates has a big disadvantage for sending these files over the internet though, and that disadvantage is that the higher the rate you choose for encoding, the bigger the file will be. Internet files are usually either 128kbit/s or 160kbit/s because this offers a reasonable trade-off between quality and size. Although you will get some squelching or distorted sounds with instruments such as ride cymbals or wind instruments at high pitch such as flutes or recorders, most music will encode very well at this low rate. Now on with the show... click the button marked "Browse..." as shown by the hand in the picture. The usual open file dialogue box will appear, and you should find the file you just saved and open it. A window like the one shown in the picture will appear and your file is now being encoded into an MP3 file. Unfortunately, the downside of this program, is that it does not offer you a location to save the MP3 in when you choose the file. This is why we had to go into the settings dialogue and alter options. When the program has finished encoding, the box will disappear, and your MP3 file will be ready for use. Congratulations, you have encoded your MP3 file!